England's Stuart Broad warmed up for a busy international summer with three wickets for Nottinghamshire against his former county Leicestershire. The paceman's haul (3-45) included the hosts' top scorer Mark Cosgrove (57), giving long-serving wicketkeeper Chris Read his 1,000th first-class catch. Ben Raine (55 not out) and Clint McKay (33) sparked a home fightback from 169-8 to 251 all out with a stand of 81. The visitors then reached 52-1 in reply at the close, losing Greg Smith (11). Like Broad, who took the first wicket of the new Championship season, James Pattinson could also be pleased with his efforts. The Australia international finished with 3-55 on his Nottinghamshire debut after skipper Read had decided against a toss and elected to bowl first. 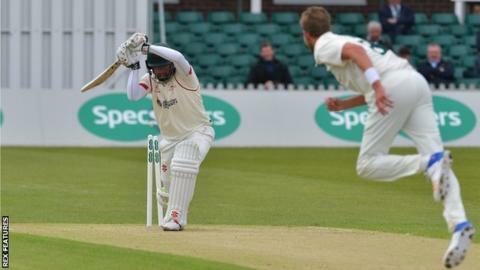 The defiant ninth-wicket stand between Raine and McKay was the only partnership of the hosts' first innings to pass 50 as Leicestershire, who were deducted 16 County Championship points for disciplinary offences on Thursday, struggled with the bat. On 1,000th first-class catch (Cogrove off Broad): "I was very happy with it, it's always a bit tough when they get a bottom edge and I didn't think it was going to carry, but it sort of kept coming at me and I managed to hang on. "The weather is set fair for the four days and it looks a really good pitch, but there was a bit of cloud cover at the start and we thought with that we could put them under pressure early on. "We'd have probably taken 251 at the start though we got ourselves into a really good position early on and then the ball seemed to go a little bit soft and we came up against some really stiff resistance later on." "They'll be the happiest, it's a very good pitch. We wanted a lot more than that to be honest. "My innings was a bit scrappy, but sometimes you have to just find a way, and I was thinking if we could get up to 250 it would at least be something to bowl at. Zak Chappell and Clint McKay both played positively, which helped. "If we can hit them hard in the morning we can bowl ourselves back into the match."